Bob “Moona” Mullins has officiated at more than 2,000 basketball games across three decades. ARLINGTON — It’s the middle of school vacation week and inside Arlington Catholic High School’s little gymnasium — home of the Cougars — the air is electric as the school’s boys basketball team is locked in a nail-biter with its hometown rival, Arlington High School. Coaches pace. Parents scream. Students cheer. Beneath the baskets, sharp elbows fly. At the center of it all, Bob “Moona” Mullins looks precisely like an easygoing traffic cop, or perhaps a learned judge calmly reviewing law books for a key citation. To some degree, he is both. “The roof could fall in and it isn’t going to faze me,’’ Mullins tells me later over cups of hot chocolate. Mullins has just refereed the latest of some 2,000 basketball games, a career that stretches across more than three decades of work that has made him one of the best and most sought-after basketball officials in Eastern Massachusetts. And then the ball is in play again, and Moona Mullins blends into the hardwood. Just where he wants to be. We’re entering a season that any basketball purist cannot help but love. Forget March Madness or the Final Four. To see the passion and the innocence of the game is to watch the high school tournament season that’s about to begin. He’s not sick in the head. Here’s what he is: He’s a retired Lynn firefighter who once earned an award for heroism for rescuing a man from a burning building. He’s a former two-time national champion in modified-pitch softball. He’s a former collegiate referee who once blew his whistle at elite players like Patrick Ewing and Pat Connaughton before they went on to play in the NBA. He’s the guy who, quite literally, owes his life to the fitness his avocation demands. In 2009, after working a game at Stonehill College, he felt light-headed and weak. What he thought was the flu turned out to be kidney failure. “They told me if I wasn’t in such good shape, I would never have made it,’’ he said. He endured 1,000 dialysis treatments. There were blood transfusions, bone marrow biopsies, stem cell transplants. In the end, his daughter Courtney was deemed a suitable kidney donor — an operation that restored her father’s health. After his illness, Mullins gave up the college game. But he returned to high school hoop, where the players’ love of sport for sport’s sake has remained constant even as their parents’ obsession with achievement has grown out of control. Back inside the Arlington Catholic High School gym, the home team has let it slip away. 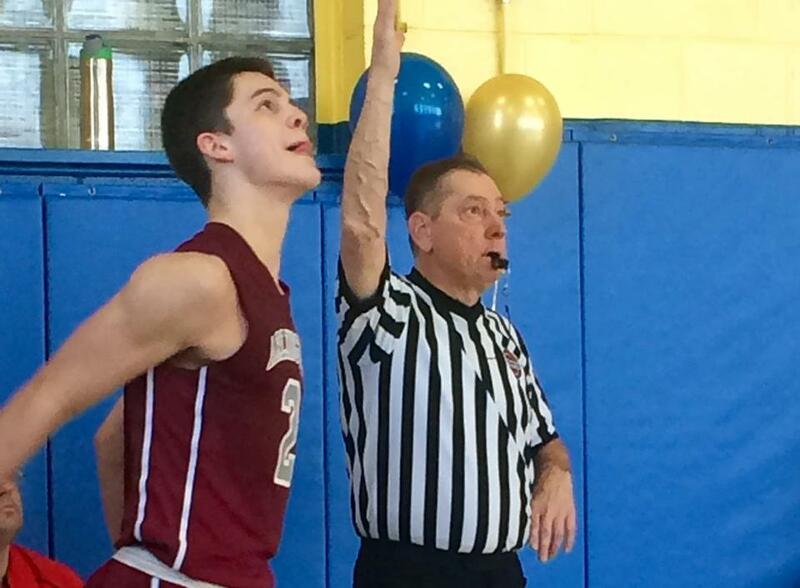 Arlington High School’s junior guard Colin McNamara poured in 25 points to lead the visitors to a 12-point win. Mullins credited the fans with superb sportsmanship. The players worked hard. Their parents, thank God, behaved. “Maybe because it’s a Catholic school,’’ he said. Then Moona Mullins, 62, jumped into his car and headed for Lynn, where he’s awaiting his assignment for another tournament season of do-or-die basketball, where he’s earned respect in the peaceful eye of the storm.